Ah, summer at last. My absolute favourite season. 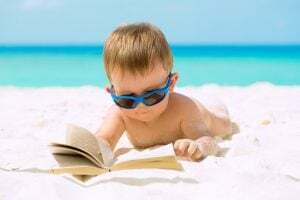 Not only is the weather warmer and the days longer, but life tends to wind down some and we have the time to laze about under a beach umbrella and lose ourselves in an indulgent summer read or three. But let’s not forget our little ones! The same applies to them – summer is the perfect time to share the joy of reading with our kids. And what better way than with a gorgeous picture book? As author Emilie Buchwald so eloquently said, “Children are made readers on the laps of their parents,” so let’s put this into action this summer and set a new generation of children on the path of becoming lifelong readers. Here are my five picks from recent Australian picture book releases. This bright and joyous picture book is for sharing with tiny tots aged 0-2 years. Lively rhyming couplets are coupled with vibrant, playful illustrations to create a wonderful celebration of parental love. Macca the adorable alpaca is back in this book bursting with festive fun and a good dose of heart. There is plenty to tickle the funny bone in this tale, but there is also a lovely message about the true meaning of the Christmas spirit and the pleasure of giving. This one is an absolute cracker. (Pun intended.) For readers aged 2+. The summer holidays can be an anxious time for those youngsters about to start “big” school in the New Year. This gorgeous picture book explores all that happens on that very important first day. Maddie may be looking all grown-up and ready, but like most she still needs a little reassurance. Authentic and relatable, this is the perfect story for kids aged 4+, especially those who are about to start school. I am a big fan of bears in stories, so this quirky tale that sees the overly popular storybook bear quit and refuse to be forced into any more stories had me laughing out loud as well as pondering the question: what animal character would make a good alternative? With Philip Bunting’s distinctive images, plenty to laugh about and much to pore over, this entertaining book is a great one for kids aged 4+. Luscious art by Ron Brooks and an exquisite text by Ursula Dubosarsky combine to create a unique story that explores the journey of a little book “made of gold” created long ago, and then following it through many generations until it finds its way into a special library collection. Packed full of wonder and history, this book is thought-provoking and layered – one that would encourage many repeat readings. For readers aged 5+. 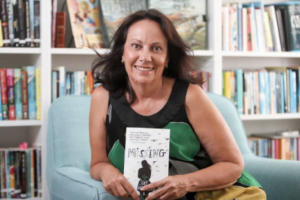 Sue Whiting is a children’s and YA author, editor and publishing consultant. Sue’s latest picture book is Beware the Deep Dark Forest, illustrated by Annie White. It is a quest story that tells the tale of courageous Rosie who enters the deep dark forest to rescue her beloved pup, Tinky. A former primary school teacher with a special interest in literacy education and children’s literature, Sue is a highly experienced speaker who loves sharing her passion for story and storytelling, reading and writing with people of all ages. Join her in her adventures in story at www.suewhiting.com. Read about Sue Whiting’s new book Beware the Deep Dark Forest, illustrated by Annie White. Thank you Sue for some excellent recommendations, will look for them in time for the great-grandchildren’s Christmas presents.